For the first time, all professionals involved in the project will be in the United States to help buyers select and design their new homes. 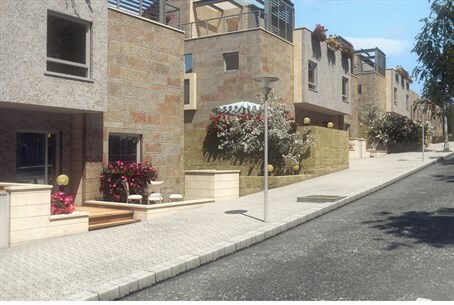 The Ramat Givat Zeev neighborhood north of Jerusalem is gaining momentum. In light of the heightened interest in the neighborhood among the Orthodox community in the United States, the developers have decided to hold an additional sales event to give more people the opportunity to join the new community. The event will take place in a unique format and will consist of two parts. The first will be a sales fair, where participants will be introduced to the many advantages of the project, which is being built exclusively for Anglo immigrants. The fair will be attended by all the professionals involved in the project, such as the architects, interior designers, lawyers, sales representatives and service representatives, who will be able to answer any questions that potential buyers have. It should be noted that the previous sales fair held in the United States several months ago was highly successful. Over a mere two days, dozens of homes were sold. That event generated a wave of increased interest and requests for a second sales event to be held. The second part of the sales event will be a formal dinner for all those who have already signed contracts for homes in the project. The professionals behind the project will address the dinner, and provide a summary of the uniqueness of each aspect of the neighborhood. Likewise, Harav Shmuel Brazil, Rosh Yeshivas Ziv HaTorah, who is moving his yeshivah and kehillah to Ramat Givat Zeev, will attend the dinner. The news that Rabbi Brazil would be joining the neighborhood was widely welcomed, as he will set the spiritual tone for the community. The evening will conclude with enjoyable entertainment for the guests. In fact, the event is a precedent, being carried out for the first time by an Israeli based developer operating in the United States. In keeping with its commitment for the highest level of service and constant oversight, Chish Nofei Israel is bringing all of the professionals as well as the marketing team from Israel to the United States to accompany the buyers in building and designing their new homes down to the last detail. In this framework, buyers will receive extensive and detailed explanations of the construction and design options available so that they can choose the details based on their personal taste and needs. It’s not for naught that Ramat Givat Zeev is generating a wave of interest. The project, which is Chish Nofei Israel’s flagship location, has been defined by the rabbanim in America as the most suitable option to realize the dream of Orthodox Jews in the America to make aliyah to Israel. The project offers exclusive advantages to ensure a comfortable acclimation to the new surroundings, emphasizing the construction of a homogenous, warm community that includes a plethora of community institutions that suit the mentality of the residents. Ramat Givat Zeev is being built on the highest standards, with rich technical specifications, large green parks and shopping centers. Likewise, the neighborhood, just north of Jerusalem, combines a suburban setting nestled in the breathtaking Jerusalem Hills, with its pristine air and beautiful scenery, along with the convenience of being close to the major Torah and chassidic center in the capital city.